The Cellar Door was small but renowned Georgetown nightclub - the kind of place with small drink tables, little dance floor, and a drink minimum. Artists as diverse as Miles Davis, Linda Ronstadt and George Carlin had performed there. 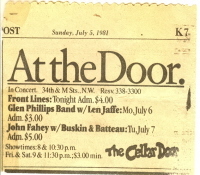 When The Front Lines played there on Sunday, July 6, 1981, there was a $4 cover and a $3 minimum drink charge. (See the ad from the Washington Post below.) There was also an opening act, not listed in the ad. It was a soap opera actor moonlighting as a comic, and I couldn't remember his name a week after the gig, much less now. I had hoped the gig in my hometown might have been sort of a homecoming filled with many familiar faces. It was not as full as I'd hoped, but there were some of my old musician friends - at least those that still lived in the area. John, the original bass player for The Lines, was there. His friends bolted later without paying their drink tab, causing a minor fuss. I think old friends Richard and Lynn were there. I'm pretty sure my Dad was there, but Nathan had a gig with Youth Brigade that very night, so he missed it. Like most bands, we had everything set up during sound check, hours before the actual performance. We had taped set lists to the floor by the monitors on stage. When the comic started his act, he decided to riff on our set list, clearly visible to him. "Desperate Living, Night Napalm, Suicide - sounds like you folks are in for an evening of light-hearted fun." Bruce was already calling me "Doctor Doom," so we were laughing, but our roadie was not. Mitev had escaped Bulgaria, worked at Jim's Char-Broil in Evanston, played heavy metal guitar, and dreamed of being a rock star. The band knew him from eating at Jim's and talking about rock guitar. He was always asking to help us as a roadie, so we had asked if he wanted to come with us on tour. He and Sam, the sound engineer for our first demo and our 4-song record, accompanied us. Mitev did have a sense of humor, but some things got lost in the translation. He did not like the comic's joking at our expense, and he let the comic know. As soon as the comic said that line, Mitev shouted at him with his Bulgarian accent. "You shouldn't talk about them like that! You haven't heard them! They are a good band!" The comic managed to mollify Mitev and finish his set without further incident. But backstage in the shared dressing room, the comic was furious, though the rest of us were straining to keep from laughing. I have no idea why there was a comic opening for us that night. It never happened before or again, and I don't recommend it to any rock band.